With the great support and coordination of the Chinese Central Government the CAAC, the General Aviation is set to become the world’s largest industry by 2025. The new policies and opening reforms already allow the low-altitude flights below 1000 m. in several Chinese areas. Figures and official estimations state that in 1999 the total number of flying hours amounted to 40.000, compared to 530.000 in 2013 and 2.000.000 in 2020. Today there are 1.654 general aviation aircrafts and 170 business jets registered in China, but the estimates boom to 9.000 general aviation aircrafts and 1.200 business jets within 2020. These figures represents a total estimated turnover of over 60 billion US$ at an annual growth rate of 20.9%. Italy, through the efforts and relationships developed by the Italian Aerospace Network, is now part of this amazing experience. 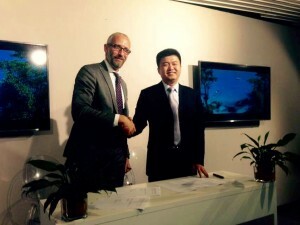 On June 29th 2015 the Signing Ceremony of the Memo of Strategic Cooperation between IAN and North Asia General Aviation Group (NAGA) took place at “Spazio Italia” in Beijing, People’s Republic of China. The Partnership between IAN and NAGA will take shape by the end of 2015, due to the creation of a Sino-Italian workforce with offices and representatives of the two Institutions involved both in Italy and in Beijing. The development site of the new Partnership is set to be in Zhejiang Province, Hangzhou City, Jiande District, that is one of the most populated Chinese areas and therefore estimated to be one of the most developing areas for General Aviation. IAN and NAGA formally therefore combine their two main projects together: the “Sino-Italian Aerospace Platform” (S-IAP) for IAN and the “Air City” (A-CT) for NAGA.